The collapse of South Canterbury Finance (SCF) is one of the biggest New Zealand stories of the last decade. This is the first book that tells this story from an 'insider' perspective, and reveals everything from poor governance and systemic issues in the finance sector, through ... read full description below. The collapse of South Canterbury Finance (SCF) is one of the biggest New Zealand stories of the last decade. The sweep of events, from Timaru to the Beehive, include some of the most revealing moments on issues critical to this country - everything from poor governance and systemic issues in the finance sector, through to the structural risks this exposed and the costs it ultimately presented to all New Zealanders. There has not yet been a book that has attempted to tell this story, certainly not one from an `insider' perspective. 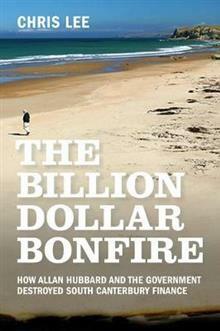 The Billion Dollar Bonfire by Chris Lee will be the first book to do both these things. Chris tells this fascinating story as both a long-standing New Zealand financial advisor and a protagonist in the narrative. As he writes in the opening chapter, he knew Alan Hubbard personally and, from the late 1990s, had clients invest with SCF. His main motivation for writing the book, made explicit throughout, is his overriding concern that this could all happen again without significant changes to our law and the culture of the capital markets industry. The book is underpinned by substantial research: thousands of documents - including new material from OIAs and other sources - and interviews, both public and anonymous, with many of the key figures. Chris Lee is a veteran in capital markets, his career spanning five decades, involving investment banking, moneylending, securities trading, portfolio management, sharebroking and financial advice. He held an executive management position in General Finance Limited in the early 1980s when it was a large finance house owned by the National Bank of New Zealand. His knowledge of the finance company sector is deep. In 1985 he formed his own sharebroking and financial advisory business. Today it has six advisers, four partners, five administrative staff and branches in Paraparaumu Beach and Timaru.